I did a research assignment on my family's history and immigration experience for school. This is what I wrote about my family immigration experience. The Family Immigration Project has been a worthwhile exercise that has furthered my knowledge of the immigration process, censuses, records, and lifestyles of the past. Because of this project, I also have a more accurate grasp of who my grandparents were as children and young adults. I still have a hard time comprehending that I now know generations and generations of my family history after a few searches on a record index. At first I had mixed results with Ancestry. It was easy to find information, such as birthplace and death year, for people if I had their name, but I had some difficulty finding their relatives. This was a problem because I was confined to the people I had the names for, and couldn’t branch out. One of the ways I tried to solve this was by asking my older family members about the names they knew about. On Thanksgiving weekend, I met with my mom’s parents and asked them for some basic information about their parents so I could fill out my table. They were able to tell me everything I asked for, but I was struck the next day by how little I had gathered. I had forgotten about the human component when I interviewed my grandparents. I spent my Thanksgiving trying to fill out my table, and not asking about the stories or the personal experience. I was very nervous because I had wasted my best chance to hear from my grandparents. Luckily, my grandmother wrote down her immigration story online. It is wonderful that she published it because my entire family can read and discuss it anytime we want. Also, her descendants will be able to hear the firsthand account of their ancestors. The article is long, detailed, and sweet. The frequent grammar mistakes only add to the comforting tone and reminds me that English is my grandmother's fourth language. I am sure that future generations will enjoy my grandmother’s article as much as I have. This is one of the reasons why my dad, my sister, and I blog. My grandmother’s article is by far the best of my stories. It was easy to find out about my mom’s side of the family because my grandparents on my mom’s side are alive and we see them often. On my dad’s side I had a hard time gathering information at first. My dad’s parents and grandparents are all dead and his uncles, aunts, and cousins live out of state. We contacted some of our extended family, but they did not get back to us. I found information from my dad’s mother’s side on my dad’s family blogs, but this was not very comprehensive and it still did nothing for my dad’s father’s side. My dad told me that his father was named Lee Perkins and that he was originally from Ireland. That was the extent of our knowledge. Using Ancestry I was able to find out the names of Lee’s parents as well as their birthdays and a general location in upstate New York where the family lived. I asked my teacher to investigate further and she traced Perkins all the way back to the late 1700’s. Perkins was from Great Britain, but much further back than my dad had thought. 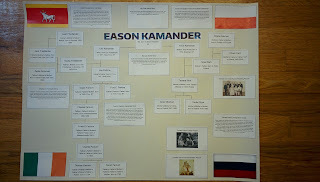 On the whole, I enjoyed this project and I am happy that I can pass on what I learned to my descendants.